The Hawkeyes Mic picks are in for the Iowa – Ohio State game. It’s almost unanimous again – a couple of us may have gone off the rails (in a good way if you’re a Hawkeyes fan). Check them out – see if you agree or disagree. Last week was a hard-fought game against the Golden Gophers and I’m happy the Hawkeyes were able to keep Floyd home where he belongs. As always, I will stick to what I know for this week’s prediction against Ohio State and that is Special Teams. I’ll start with the punting game. Ryan Gersonde had a hard time finding a groove last week and I believe the cold weather is starting to have a direct effect with his performance. Ryan is a freshman and we forget that high school football is over during this time of year, which means this will be his first time playing this late in a season. Cold weather can take a toll on a lot of specialists mentally. The ball doesn’t go as far since the air is less dense and it doesn’t mold around your foot when you kick the rock. When that happens kickers and punters try to hit the ball harder causing their form and mechanics to go right out the window. Mature and older specialists mentally accept the fact that the ball is going to travel less in the air and stick to their mechanics, which in turn makes them more successful during the month of November. Ryan should start to find his way in practice this week and I have full confidence in his abilities on the biggest stage of his career this Saturday. 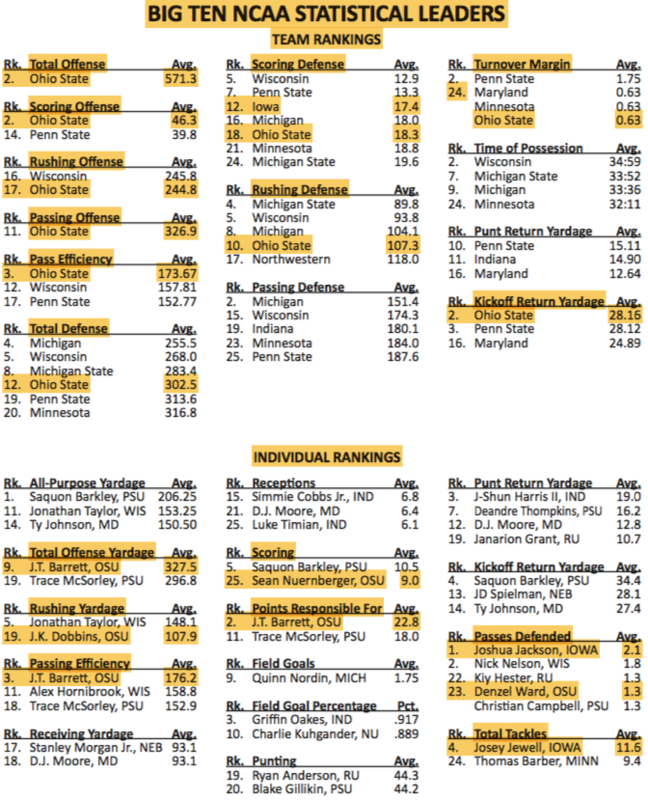 Ohio State averages 42 yards per punt this season against Iowa’s 39 yard average. A lot of people don’t understand how important field position is during a game. I call it hidden yardage and if you can account for more yards than the other team (strictly on special teams) you will see a difference in the scoreboard as well. If you don’t believe me, re-watch the Michigan game last year. Miguel Recino’s has been very solid on kickoffs and Iowa’s coverage team is fantastic. I believe we will allow less hidden yardage on kickoff coverage than Ohio State’s kickoff team will. If you watched the Penn State vs. Ohio State game last week you should have noticed Penn State housing the opening kickoff. This means Ohio State will try to fix that mistake in practice this week so it doesn’t happen again. I believe it will happen again on Saturday against the Hawkeyes, or they will at least allow a big return. Ohio State has a better field goal percentage than Iowa does and I think this will be a trap game for Ohio State. A trap game is a game following a big win against a big opponent. Ohio State is walking tall after knocking off Penn State last week. I believe they’re overlooking Iowa as a competitor and will allow some big breakout plays. This will give Iowa a chance to capitalize where they do great things –defense and special teams. I have Iowa beating Ohio State 17-15. As always thanks for having me on Hawkeyes Mic! Iowa has a good enough defense to stay in this game, but can its offense move the ball and score points on those possessions? Based on what we’ve seen from the running game, it’s unlikely on a consistent basis. The Hawkeyes should get a bump from its partisan crowd but the Buckeyes are a level above everyone in the Big Ten. In the fourth quarter, they probably prove it. Iowa’s defense won’t make life easy on the Buckeyes, but the Hawkeyes do hang around at home. In the end, Ohio State has too much J.T. Barrett, too much skill on offense and in what could be a bit a trap game sandwiched between Penn State and Michigan State, the Buckeyes pull away late to remain unbeaten. Yes, I’m the only media member (loosely used term of course) to pick Iowa to win. Channeling the late Bob Brooks here and being a bit of a homer, I think Iowa’s stout defense is the key at Kinnick. I could use the transitive property with Iowa nearly beating Penn State & Penn State nearly beating Ohio State but… you know, never mind, I will use that. I’m making a pick based on a hunch and a trend. Under Ferentz, Iowa has played elite teams close and beaten them at home. The key is the first quarter. If OSU can spark momentum immediately, it could get uglier than an offensive coordinator shouting expletives into a replay booth. If Iowa can temper the momentum and make OSU one-dimensional, we’ve got a game and potential upset. If it’s 49-0, Tweet @TylerTjelmeland and I’ll happily take your criticism. Iowa can’t be afraid of this team, because they are beatable. Kirk Ferentz raved about Ohio State’s defensive line during his Tuesday media availability, saying it’s the best Iowa has seen this season. With the Hawkeye offensive line struggling to create push, the Iowa offense could have real struggles moving the ball come Saturday. When Iowa’s better unit takes the field, Ohio State will trot out a Heisman contender and other All-Conference type talents. JT Barrett has been magnificent in recent weeks, and both JK Dobbins and Mike Weber will give Iowa troubles. I put some stock into Iowa’s recent performances against heavyweights at Kinnick, but I don’t think Iowa has the guns to keep up in this shootout. I think the Buckeyes are the best all-around team – most talent, most speed, most depth – that Iowa has faced since it played Stanford in the Rose Bowl. And we all remember how that turned out. Ohio State’s scheme is not a good match-up for the Hawkeyes. Iowa’s only hope is that its Offense can develop and maintain some consistency from start to finish. If it does that, the Defense will get the assistance it will need to bend but not break. If Iowa’s Offense were as good as its Defense right now, I think the Hawkeyes would have a legitimate shot playing the Buckeyes in Kinnick on a Black-Out Saturday. But that’s not the case. Ohio State’s Team has an abundance of everything. Iowa’s does not. It has a chance to be closer than most think but only if the Hawkeyes Offense plays its best game of the season. Unfortunately, that just isn’t likely because it would have to do that vs. the Buckeyes Defense. I just don’t think that’s in the cards.